Arby’s highlights it has more than roast beef in a new ad, focused on its wide range of sandwiches. The spot features “Arby’s Head of Sandwiches” walking through a restaurant kitchen and asking himself why “people still think Arby’s is just roast beef” when the brand has 17 other sandwiches. He comes with a series of possible answers, that include “all those 60-foot signs that say ‘Arby’s Roast Beef Sandwich Is Delicious'” and the consumers’ last visit to Arby’s, which was with their grandparents, “who ate exclusively roast beef every meal, somehow”. 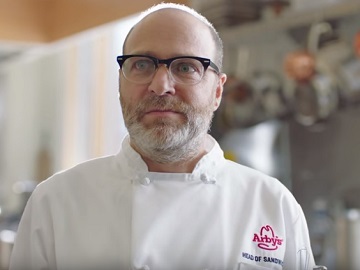 At the end of the commercial, when the voiceover says the chain’s tagline, “We have the meats,” the Head of Sandwiches character is seen again, mentioning that Arby’s has the meat “for sandwiches” while pointing towards them. It is thus introduced the fast-food chain’s new tagline, “We have the meats…for sandwiches”. Arby’s range of sandwiches also includes Signature Sandwiches, like Turkey Gyro, Traditional Greek Gyro, Smokehouse Brisket, Reuben and Loaded Italian, Market Fresh Sandwiches, like Roast Turkey Ranch & Bacon Sandwich, Roast Turkey & Swiss Sandwich and matching wraps. Ham ‘N Cheese Slider, Buttermilk Chicken Cordon Bleu Sandwich, Buffalo Chicken Slider, Pizza Slider, Jalapeno Roast Beef Slider are also included on Arby’s menu. The chain also advertises, in a new ad, its limited-time deal on Gyros, now 2 for $6. The spot is part of a campaign from creative agency Fallon aimed at reaching younger consumers who may not eat roast beef as much and have, instead, a taste for different products. Launched on Sunday, September 9, in the U.S. across TV and digital platforms, the campaign does not feature a celebrity in the role of the Head of Sandwiches because Arby’s wanted to “keep the food at the center of things,” according to Arby’s marketing chief, Jim Taylor. Consumers will get the chance to interact with the fictional head of sandwiches through a series of “brand experiences” organized by the fast-food chain as part of the campaign.